Italian Paper Talk: Beautiful Seven For Inter As AC Milan Hit Five! 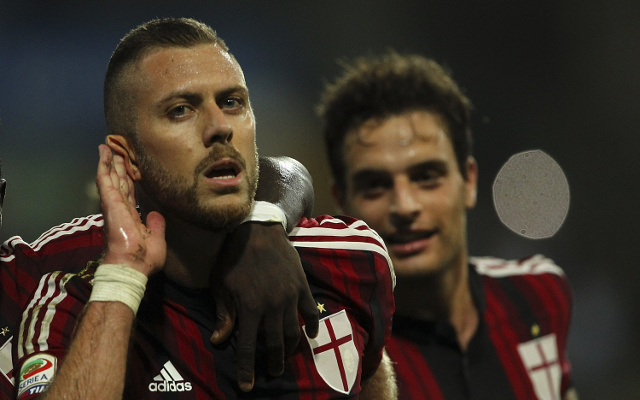 All the latest headlines from the newspapers in Italy as AC Milan secure a stunning 5-4 win over Parma on Sunday night including a gem from Jeremy Menez. – Inter, beautiful seven, Nerazzurri replicate 7-0 scoreline of last season over Sassuolo. – Milan hit five, crazy game decided an incredible strike by Jeremy Menez, Parma furious, Rossoneri at the top with Juventus and Roma. – Pippo Inzaghi delighted with win despite suffering at times, his new Milan excites as Menez continues to impress in the ‘false nine’ role. – Chievo hit Napoli, San Paolo protest Aurelio De Laurentiis and Rafa Benitez. – Beppe Marotta: “Lotito dangerous”, Juventus attack: “He has too much power,he is father and master”. – Claudio Lotito responds: “I speak only with Agnelli”. – Beppe Marotta-Lotito words of fire. – Marotta: “Too much power, he’s dangerous”. – Lotito: “I speak with Agnelli, my opposite number”. – Carlo Ancelotti: “I’ll win again with Real”. Italian tactician coming under increased pressure after loss to Atletico Madrid on Saturday. Having lost Angel Di Maria in the transfer window, there is a struggle to find balance while the boos continue for Iker Casillas and Florentino Perez. – Massimiliano Allegri: Alvaro Morata for the cup, Juventus prepare for Malmo Champions League clash, as new signing gets four minutes against Udinese. – Napoli flop, defeated and whistled. – Milano boom, Inter hit seven, impressive Milan. – Disappointing Torino, bounce back against Bruges. – Colantuano strikes in Zeman’s home, Genoa inspired by super Perin.